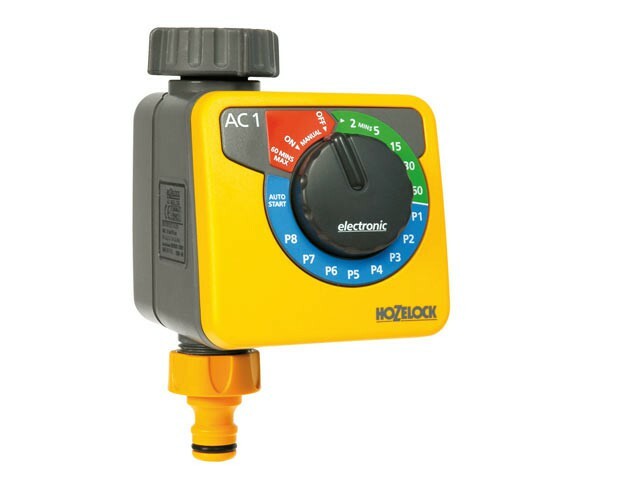 The Hozelock 2705 Aqua Control 1 electronic water timer offers a variety of watering durations from once per week up to four times per day. The large dial allows programs to be easily selected. Five once-a-day options of variable durations are supplemented by 8 pre-set programs offering a range of watering schedules. Supplied with an aide memoir sticker. Connects to 1/2, 3/4 and 1 inch tap sizes. Outlet connects straight to hose connector.